This Saturday, the UC San Diego women’s swimming and diving team faced off against inter-city rival University of San Diego at USD’s Sports Center Pool. In their regular season finale, the Tritons emerged victorious, defeating USD 145.5–137.5. Sophomore Elee Wong, senior Angie Phetbenjakul, junior Emily Lambert, and senior Haley Murphy opened the meet with 1:46.51 in the 200 medley, giving UCSD its first win of the meet. 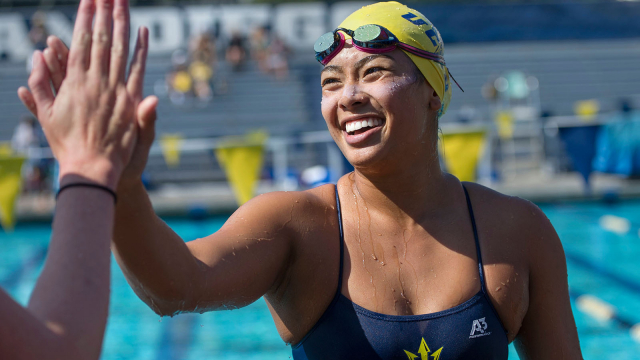 Wong, Phetbenjakul, and Murphy all went on to again claim first place in their individual events: 50-meter backstroke, 100-meter breaststroke, and 50-meter freestyle, respectively. Freshman Rachel Taylor easily handled the competition in the 200-meter breaststroke — hitting the wall almost seven seconds ahead of the next closest swimmer — completing the race in 2:17.55. Taylor had continued success through the meet, earning first in the 100-meter breaststroke and second in the 200-meter individual medley; her times were 1:05.08 and 2:08.50, respectively. Junior Brooke Abrantes came out on top in all of her springboard diving events; she scored 292.80 on the three-meter and 267.75 on the one-meter. Overall, the Tritons took first place in nine events, coasting to a victory. The Tritons will have two weeks off before they travel to La Mirada to participate in the Pacific Collegiate Swim and Dive Conference, which lasts from Feb.14 to Feb. 17. UCSD looks to extend its regular season success into the postseason.